Most of Manchester University’s 260 spring 2014 graduates have jobs or are in graduate school. 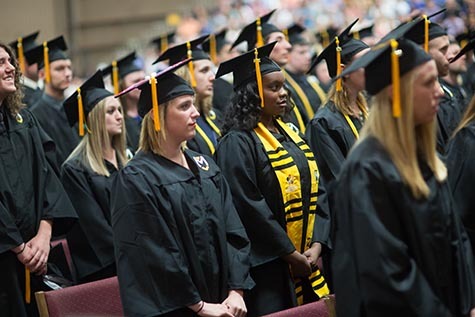 “Manchester graduates are well-prepared academically and have experiences that make them highly successful in the job market," said Liz Bushnell, associate dean and director of MU Career Services. In addition to rigorous classwork, most graduate after enriching internships and volunteer work that help prepare them for the professional world and offer valuable sources for networking. “It’s great to see my hard work pay off,” said Louise Magiera Helm, who utilizes her psychology degree and English minor as an employment consultant at Stone Belt in Bloomington. She serves people with physical or mental disabilities in finding and retaining employment. 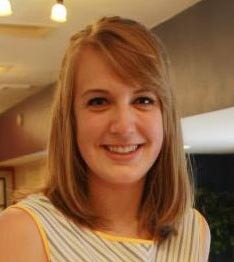 At Manchester, Helm was president of a student club, held part-time jobs and studied abroad. She became interested in nonprofits as a career choice after winning an internship award from Career Services and spending the summer at the United Way of Porter County in Valparaiso, Ind. Year after year, MU’s newest graduates report success – at a five-year average of 95 percent – despite the rough economy. Every spring 2014 MU accounting graduate is employed, for example, and many locked in their jobs months before commencement. Almost 18 percent of the Class of 2014 are earning advanced degrees – at dentistry and law schools, and studying chemistry, physics and psychology. Some are at Manchester’s own College of Pharmacy in Fort Wayne, pursuing a four-year professional doctorate. Many of the graduate-degree seekers are research and teaching assistants at major universities. 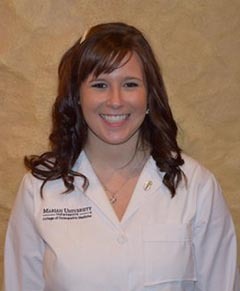 Caitlin Kessler is a student at Marian University College of Osteopathic Medicine in Indianapolis and ultimately wants to become a physician in family practice. The Kokomo, Ind., native said her classes prepared her for the hard work of medical school, but real-world experience gained at Manchester made the real difference. The MU Success Center helps students and alumni write resumes, practice job interviews and search for jobs. MU seniors have first-time success on CPA, the Praxis (Indiana’s test for teaching certification) and entrance exams for graduate and the health professions. MU students volunteer more than 60,000 hours annually – helping others less fortunate, tutoring, building houses and schools, helping to deliver medical aid in Central America, raising funds for charities – indicating to employers MU applicants care about others and want to help. Manchester offers an employment guarantee: a job or graduate school within six months of graduation or return for a full year, tuition-free. For more, visit https://www.manchester.edu/tripleguarantee/. *The data are based on a 95.6 percent response rate among graduating seniors. The National Association of Colleges & Employers encourages institutions to achieve a response rate of at least 65 percent.